January Current Affairs. 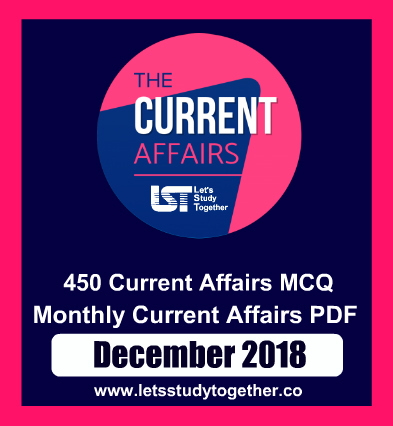 Important Current Affairs Questions – 14th January 2019. Daily Important Current Affairs. Daily Current Affairs PDF. Welcome to the www.letsstudytogether.co online Current Affairs section. If you are preparing for IBPS PO/Clerk, Canara Bank PO, banking & Insurance, SSC , Railways and other competitive exams, you will come across a section on the Current Affairs. Here we are providing you “Important G.K. & Current Affairs Questions “ in PDF format based on the current events for your daily practice. 1. Which state announced its decision to withdraw from the Ayushman Bharat health scheme? Explanation: West Bengal Chief Minister Mamata Banerjee on Thursday announced that her state will withdraw from the Ayushman Bharat health scheme. After announcing the state government’s decision to pull out of the scheme, Mamata Banerjee accused Prime Minister Narendra Modi of making “tall claims” under the health coverage programme and duping people. Mamata Banerjee alleged that PM Modi took undue credit for a project, 40 per cent of which, the West Bengal government was funding in the state. Touted as the world’s largest public healthcare scheme, the Ayushman Bharat project was announced by PM Modi in September 2018. The scheme aims to provide a basic health coverage of up to Rs 5 lakh for 10 crore economically backward families. 2. The Ministry of Tourism has recently sanctioned four new projects for Rs. ___________ under the tourism infrastructure development schemes, Swadesh Darshan and PRASHAD. Explanation: The Ministry of Tourism has sanctioned four new projects for Rs. 190.46 Crores under the tourism infrastructure development schemes, Swadesh Darshan and PRASHAD in the states of Meghalaya, Gujarat and Uttar Pradesh recently. The Ministry of Tourism has launched the schemes of Swadesh Darshan – Integrated Development of Theme-Based Tourist Circuits and PRASHAD- Pilgrimage Rejuvenation and Spiritual, Heritage Augmentation Drive in the year 2014-15 for the development of tourism infrastructure in the country. 3. Which country recently topped the EIU Democracy Index 2018? Explanation: The 11th edition of EIU Democracy Index 2018was released by the Economist Intelligent Unit compiling the state of democracies in 167 countries in the world. In the list, Norway topped and India has ranked at 41st place on the Economist Intelligence Unit’s annual Global Democracy Index. 4. The World Economic Forum announced that Tata Steel’s plant in ___________ has been inducted into its prestigious community, a distinction awarded to manufacturing facilities which are seen as leaders in technologies of the ‘Fourth Industrial Revolution’. Explanation: The World Economic Forum announced that Tata Steel’s plant at IJmuiden in the Netherlands has been inducted into its prestigious community, a distinction awarded to manufacturing facilities which are seen as leaders in technologies of the ‘Fourth Industrial Revolution’. Assessing more than 1,000 factories in 2018, the WEF recognised Tata Steel’s IJmuiden plant and six others as ‘Manufacturing Lighthouses’ – state-of-the-art production facilities which successfully adopt and integrate the cutting-edge technologies of the future and drive financial and operational impact. 5. Who was recently conferred the ICSIs Lifetime Achievement Award for ‘Translating Excellence in Corporate Governance into Reality’? Explanation: Industrialist and Godrej Group Chairman Adi Godrej was conferred the ICSIs Lifetime Achievement Award for ‘Translating Excellence in Corporate Governance into Reality’. The awards were instituted by The Institute of Company Secretaries of India (ICSI), which is celebrating its golden jubilee. 6. Virat Kohli and __________ recently received the honorary membership of the Sydney Cricket Ground (SCG) for their contribution to the sport of cricket. Explanation: India skipper Virat Kohli and coach Ravi Shastri on Friday received the honorary membership of the Sydney Cricket Ground (SCG) for their contribution to the sport of cricket. The Indian team defeated Australia 2-1 in the four-match Test series, ending the country’s 71-year-old wait for a rare series win Down Under. 7. Who has been sworn in recently for a second term as Venezuela’s president? Explanation: Venezuelan President Nicolás Maduro has been sworn in for a second term amid international calls for him to step down and a devastating economic crisis, but with some long-time friends in attendance both from abroad and at home. A dozen Latin American governments, U.S. and Canada have rejected the legitimacy of Maduro’s next term, and Washington has sanctioned top officials in his government, and there were fresh condemnations. 8. Taiwan President has appointed _________ as Prime Minister recently during a cabinet reshuffle. Explanation: Taiwan President has appointed Su Tseng-chang as Prime Minister on Thursday, during a Cabinet reshuffle following the ruling Democratic Progressive Party’s heavy losses in local elections. Su is a former premier appointed in 2006 by then-President Chen Shui-bian and was a chairman of Tsai’s Democratic Progressive Party for two terms. 9. Who was recently named Chef de Mission for the 2020 Tokyo Olympics? Explanation: Birendra Prasad Baishya, president of the Indian Weightlifting Federation (IWF) was on Thursday named Chef de Mission for the 2020 Tokyo Olympics. Baishya is also one of the IOA vice presidents besides holding several other positions like executive board member – International Weightlifting Federation, vice president of Asian Weightlifting Federation and vice president of Commonwealth Weightlifting Federation. 10. Indian Army’s Air Defence Corps celebrated the Silver Jubilee of its raising on _________. Explanation: Indian Army’s Air Defence Corps celebrated the Silver Jubilee of its raising on January 10. To mark the occasion, a Wreath Laying Ceremony was held at the Amar Jawan Jyoti at India Gate, New Delhi. Lieutenant General Ashwani Kumar, Adjutant General and Lieutenant General AP Singh Director General and Colonel Commandant Army Air Defence laid ceremonial wreaths. A host of serving officers, soldiers and veterans attended the ceremony. The Corps of Army Air Defence is the youngest arm of Indian Army. The Corps has proved its mettle in various wars, counter insurgency operations and nation building tasks. 11. The National Library of India, sometimes seen in news, is in ___________. Explanation: The National Library of India on the Belvedere Estate in Alipore, Kolkata is the largest library in India by volume, 14th in the list of largest libraries, and India’s library of public record.It is under the Ministry of Culture, Government of India. The library is designated to collect, disseminate and preserve printed material produced in India. The library is situated on the scenic 30-acre (12 ha) Belvedere Estate. It is the largest in India with a collection in excess of 2.2 million books. Before independence, it was the official residence of Lt. Governor of Bengal. 12. The B3, formerly BM&FBOVESPA, is a stock exchange located in _________. Explanation: The B3, formerly BM&FBOVESPA, is a Stock Exchange located at São Paulo, Braziland the second oldest of the country. At the end of 2011 it had a market capitalization of R$2.37 Trillion, making it the 13th largest stock exchange in the world. However, owing the slump in economic growth in Brazil associated with political problems, in addition to the strengthening of the U.S. Dollar vis-à-vis the Brazilian Real, the capitalization shrank to R$2.21 trillion by the end of 2015. 13. Durand Cup, sometimes seen in the news, is related to which among the following sports? Explanation: The Durand Football Tournament or Durand Cup is a football competition in India which was first held in 1888. It is co-hosted by the Durand Football Tournament Society (DFTS) and Osians. All the matches are free-of-cost for spectators, and the winner gets ₹ 50 lakh. The Tournament is named after its founder, Sir Mortimer Durand, Foreign Secretary in charge of India from 1884 to 1894. Sir Mortimer was recuperating from illness at the leading hill station of British India, Simla in northern India. Having become conscious of the value of sport as a means to maintain health, he decided to present a prize to encourage sporting competition in India. At first it was effectively an Army cup, and largely the preserve of the British Indian Armytroops in India, but over the years it widened its appeal and opened up to civilian teams, until it became a more open and conventional sporting contest. 14. The World Investment Report has been published by __________ annually since 1991. Explanation: The World Investment Report has been published by the United Nations Conference on Trade and Development (UNCTAD) annually since 1991. The report focuses on trends in foreign direct investment (FDI) worldwide, at the regional and country levels. United Nations Conference on Trade and Development (UNCTAD) was established in 1964. 15. Dasht-e Margo, sometimes seen in the news, is in which among the following countries? Explanation: Dasht-e Margo, also Dasht-e Mārgow or Dasht-e Margoh, is a desert region in the southern provinces of Helmand and Nimruz in Afghanistan. The desert is adjacent to the Dasht-e Khash and Registan Desert. It is the world’s 20th largest desert at about 150,000 km2 in area with an elevation of 500–700 m. The desert consists mainly of sand masses and rocky-clayish plains with solonchaks, takirs, and rarely oases.